The tables were mostly filled when we got there and it was just after 9pm! Luckily the line wasn't bad. This shot was taken just before we left. 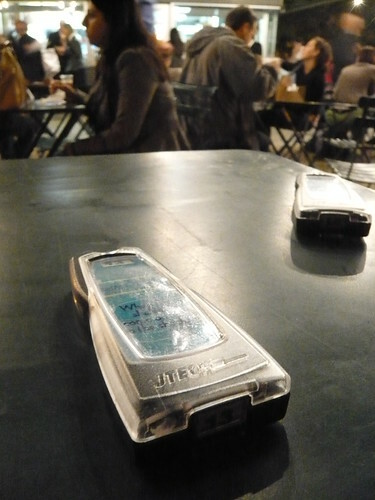 Impatiently waiting for the buzzer to go off haha. 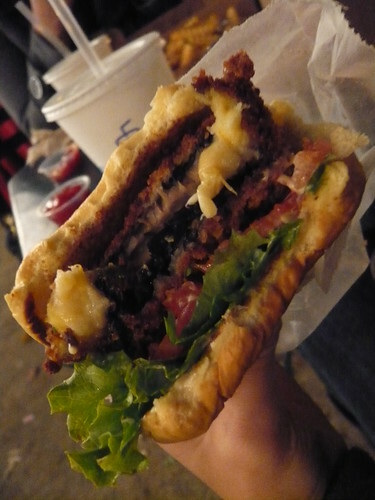 ... sandwiched around muenster and cheddar cheese which is why the patty was so thick! The egg bun was so soft and chewy, the batter had a nuttiness to it, the portabello wasn't overpowering, the cheese was nice and gooey, all combined with just a bit of sauce... mmm. I still hold a special place for In-and-Out animal style though but this is good too. Yes, In and Out is a chain but it's seriously good. It's a different type of burger though. 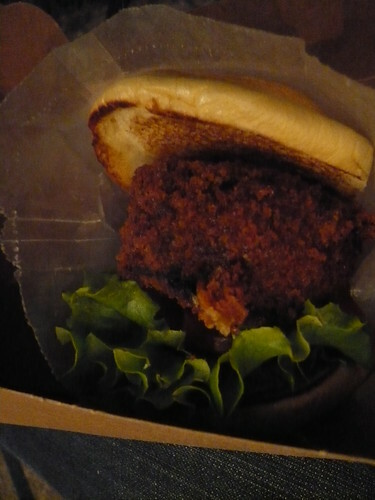 Michelle says Shake Shack's burger has a home made quality to it. Probably due to the bun. The bun is that good. The staff is refreshingly friendly as well. 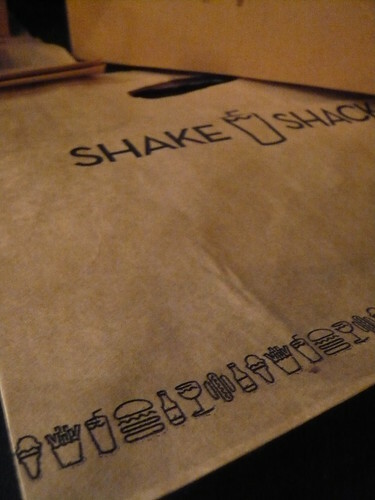 Michelle had the Shack Burger and we shared fries and each had a lemonade. The fries were ok. I'm sure the cheese fries would've been better. The lemonade was a bit too tart for me. 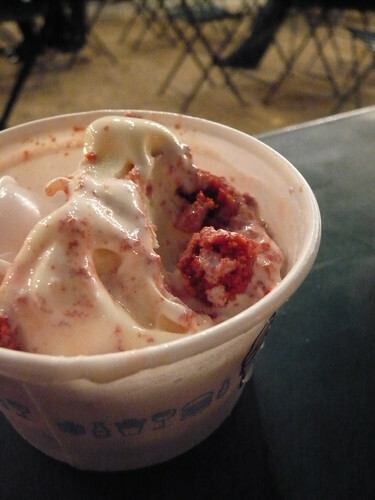 Tuesday's frozen custard for September: Red Velvet - the custard was so good. Happy dance worthy. But the red velvet could've been a bit better, more moist but I wonder if that may be due to possibly being in the fridge premixed with the custard. Then again, I have been spoiled with some pretty damn good red velvet cake. 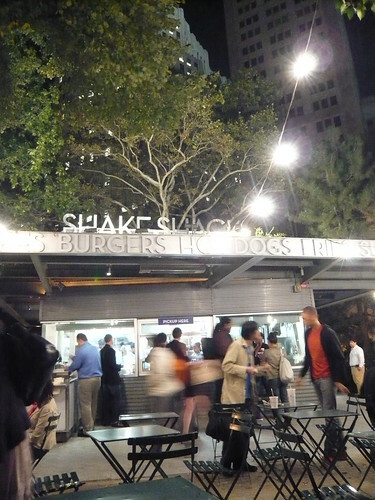 Shake Shack has done some pretty good branding. I really like their website which is simple, clean and to the point but fun! I also like the set of icons developed for the different food items. Especially the squiggly for the lettuce in the burger. It makes the icon.